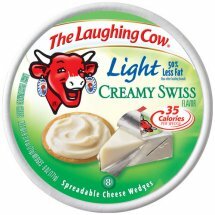 The Laughing Cow Light Creamy Swiss Spreadable Cheese Wedges are a favorite French indulgence that has a lighter side. Indulge in the rich creamy-delicious taste of imported Swiss cheese blended with a touch of cream for easy spreading. [Cheddar, Swiss And Semisoft Cheese (Pasteurized Cultured Milk And Part-Skim Milk, Salt, Enzymes)], Nonfat Milk, Whey, Ultrafiltered Nonfat Milk, Water, Sodium Polyphosphate, Citric Acid, Salt.